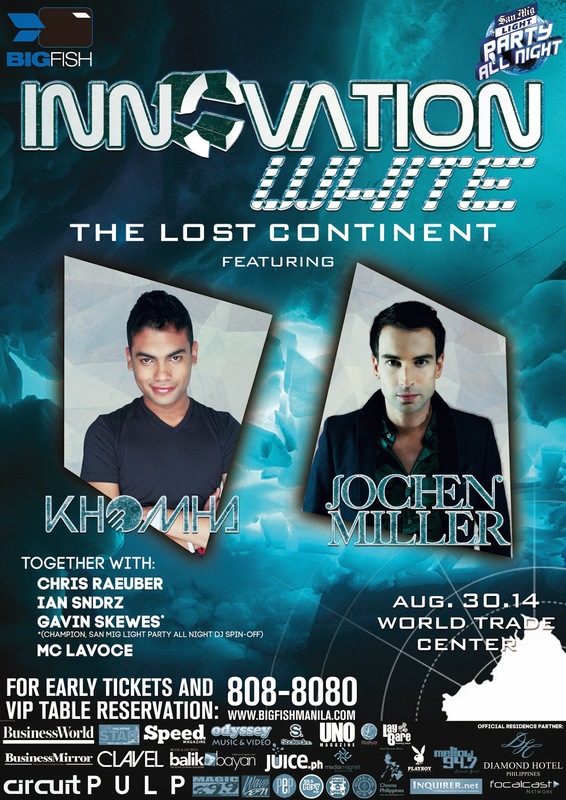 It's time to party all night once again as the biggest name in events BIGFISH INTERNATIONAL launches one of the most awaited bash in the country called INNOVATION WHITE: The Lost Continent. This one's going to be really wild as international DJ's Jochen Miller and KhoMha will be spinning together with BigFish's great resident DJ's Chris Raeuber, Ian Sndrz and many more! Jochen Miller is one of the most famous trance musicians in the Netherlands and has also hosted a couple of radio shows in Europe. He'll probably play his famous tracks "Stay connected", "Face Value", "Brace yourself" and "Lost Connection" to make this event even more epic as ever! KhoMha also has played the world stage and wants you to hear more of his Progressive House, Trance and an evolving brand of music he's roaring to spin in Manila. Every VIP table also comes with a premium bottle of Absolut Vodka, 10 San Mig Light and a Mixer. VIP Tickets come at 3,500 each which includes 2 drinks. Cocktail tables on the other hand is only 7,000 good for 5 people and comes with 20 bottles of San Mig Light too. Current pre-sold tickets are 700 and door charge is 1,200. For reservations, please call 09178847333 or their land line 8088080. For more details, please check their channels below. Remember its August 30, 2014, work hard, party harder!